If you have a big Excel file, with lots of pivot tables and their source data, I've written a macro that might help you. The macros creates a detailed list of all the pivot tables in the workbook, so it's useful for documentation, and some types of troubleshooting. Continue reading "Excel Pivot Table Troubleshooting"
Instead of adding a static title to your Pivot Chart, use a worksheet formula to create a dynamic chart title. Then, when you make a selection in the Report Filter, the chart title will change too. The video below shows the step-by-step instructions. 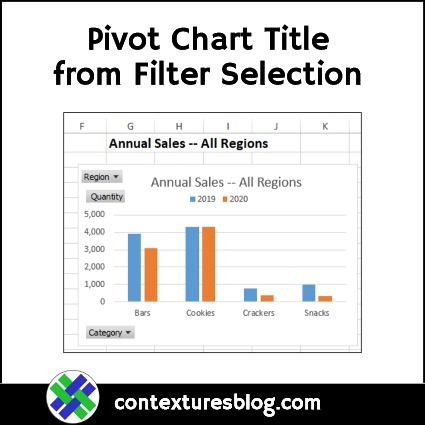 Continue reading "Pivot Chart Title from Filter Selection"
When you double-click a pivot table value cell, Excel adds a new sheet to your workbook, with the details for that summary value. To make it easy to find those sheets, and delete them later, use the latest version of my macros to rename Pivot Table DrillDown sheets. Continue reading "Rename Pivot Table DrillDown Sheets"
When you're building a pivot table, if you add fields to the Values area, Excel automatically adds "Sum of" or "Count of" to the start of the field name. You can manually remove that text, or use macros to quickly change the headings. There is one macro example here, and more on my Contextures website. Continue reading "Remove Sum of in Pivot Table Headings"
When you create a pivot table, a default PivotTable Style is automatically applied. You can change to a different style, and you can even create custom pivot table styles. To help you keep track of the styles that you have, here's a List All Pivot Table Styles macro. Continue reading "List All Pivot Table Styles Macro"
How can you copy a pivot table custom style to a different workbook? There isn't a built-in way to do that, but there is a workaround solution. There are instructions that worked in Excel 2013, and earlier versions (way back to Excel 2007). Those stopped working, unfortunately, but there's an easy way to do this in Excel 2016 too. Continue reading "Copy a Pivot Table Custom Style to Different Workbook"
Congratulations to the USA Women's Hockey team, who won the Olympic gold medal. They beat our Canadian team, in a hard-fought game that went into overtime, and ended with a shootout. The team rosters were available online, so I used those for a hockey player data analysis, in Excel pivot tables. Is there anything in the player data that shows why the USA team won? Continue reading "Hockey Player Data Analysis in Excel"
Instead of showing a budget's forecast, actual and variance data all at once, click a button to view the values one at a time. That makes the report easier to read, and takes less space on the worksheet. See how this technique works in my Budget Reporter with value selector workbook. Continue reading "Excel Budget Report with Value Selector"
If you try to group pivot table items in Excel, you might get an error message that says, "Cannot group that selection." For older versions of Excel, if you had a problem grouping pivot table items, it was usually caused by blank cells, or text in number/date fields. For Excel 2013 and later, there's another thing that can prevent you from grouping. 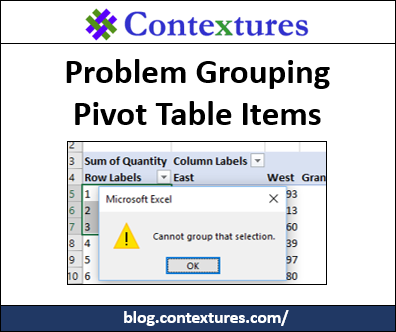 Continue reading "Problem Grouping Pivot Table Items"
To see specific data in an Excel Table, you can select an item from the drop down filter in a column heading. Someone asked me if there was a way to scroll through the items, instead of opening the filter list each time. This technique uses a pivot table, which could be hidden on a different sheet, and a spin button, to go up or down in the list of items. Continue reading "Scroll Through Filter Items in Excel Table"